Has the violin been relevant to jazz over the years or is it not an instrument that lends itself to the jazz environment? There have been many exponents of the instrument over the years but none have had an impact on the course of jazz in the manner of a Charlie Parker or John Coltrane but is that a necessary quality for it to be relevant? Svend Asmussen is from Denmark and there is no doubt in the technical ability of his playing but I would consider that brings anything new to the genre. All the tunes on the album are well known standards apart from Frederic Chopin’s “Prelude in C-Minor” and all are played with great skill. Ellington’s “Sophisticated Lady” is played with passion and feeling and includes some interesting piano work by Georges Arvanitas who for me the star of the album both on the swingers and the ballads. The pianist’s solo on “Things Ain’t What They Used To Be” is a tour de force and is followed by some pizzicato playing by Svend Asmussen and also a fine baas solo. “Just A Gigolo” is taken at a nice easy pace and in which both the violinist and the pianist have strong solos which have a large degree of emotional content. 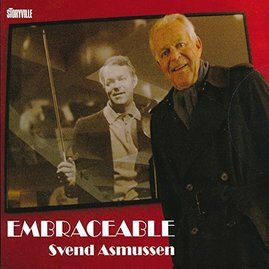 Gershwin’s “Embraceable You” is something of a disappointment Svend Asmunnen’s approach to the tune does not bring out the best in this beautiful melody. Sonny Rollins’ “Pent-up House” is something of a surprising choice but works out well with spirited performances from all the group. Whether this is the album for you depends on how you feel about the violin jazz but there is much to be appreciated in the groups approach to the music, this helped with it being a live performance that creates a good atmosphere. I must admit I found my foot tapping during some of the tracks.